Day 3 of the Trofeo Princesa Sofia Iberostar regatta on Mallorca and stronger winds look to be on the way. This will come as a relief to those whose Olympic build-up has taken a set-back in the light winds of the first two days. The target for any Olympic hopeful are the medal races at the end of the week and to be there you have to be in the top ten of the leaderboard at the end of qualifying on Friday. From today the fleets racing in flights will now split into gold and silver fleets, concentrating the action to reach the top ten places. The exception are the 49er and RS:X crews, who started a day late and are playing catch-up. With the British selection process now underway, some will be feeling the pressure and today could be their day to get back on track. The British Sailing Team (BST) has already split into several groups at this early stage. 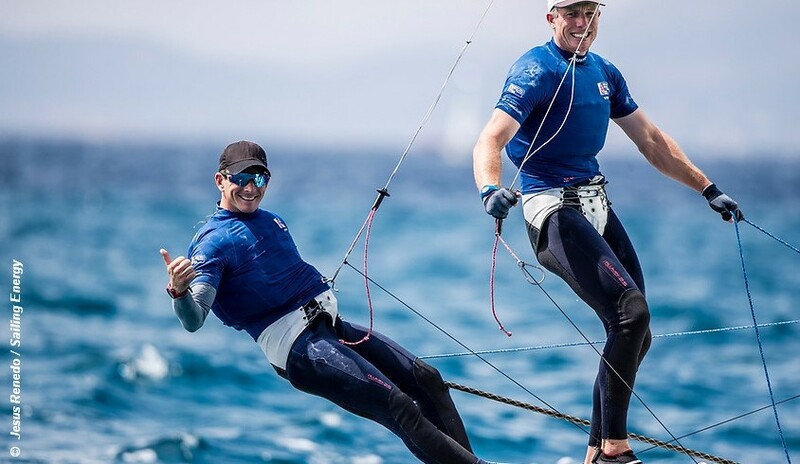 Those already looking comfortable, namely: Mills and McIntyre (470), Dobson and Tidey, Weguelin and Ainsworth (49erFX), Giles Scott and Ed Wright (Finn), Lorenzo Chiavarini (Laser) and Saxton and Boniface, and Gimson and Burnet (Nacra17) already sitting in a Top 10 position. Those with a chance to still make the Top 10 such as: Patience and Grube (470), Nick Thompson (Laser) and then a third group where the chances are either unlikely or we will have to wait until the end of today for them to have completed sufficient races to be meaningful. This group include the 49er, Radial and the two RS:X classes. The RS:X and 49er have only completed one day, while the Radial has only Georgina Povall in 21st place after four races. The 49er is well on the way with Fletcher and Bithell on form, but the BST RS:X team looks to be in the midst of a sea-change and has yet to settle. Some good results but not consistant enough yet to raise hopes. So, plenty still to race and the weather holding the key, not just for the Brits but accross the huge fleets, where the lighter wind specialists have been making their mark. It could all change today.